The GRC Institute is the preeminent not-for-profit member association servicing the needs of compliance and risk management professionals since 1996. We aim to provide members with valuable content and relationships which will help escalate them in their profession. We aim to unify and strengthen the compliance and risk profession to provide a community in which individuals can come together to share knowledge, challenges and ideas on solutions to mould their vision for the future. 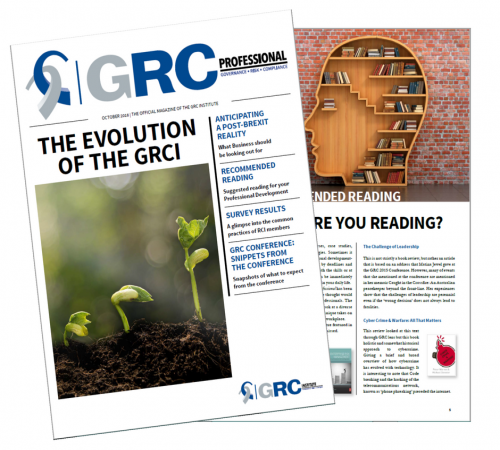 The GRC Professional provides news updates and a platform for informed discussions on issues affecting the governance, risk and compliance profession. 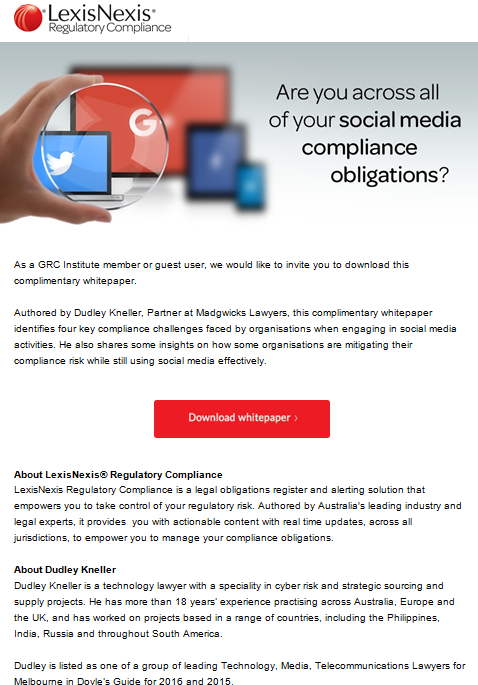 It is an opportunity for professionals to see what challenges are in other industries and to hear from regulators on what they need to know to ensure their organisations meet their regulatory obligations. It is a quarterly magazine (formally a monthly magazine). 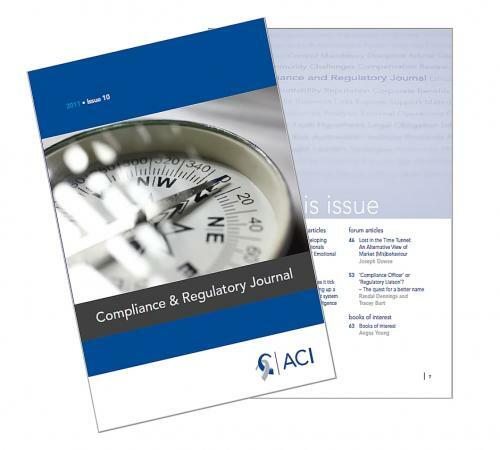 We publish the Compliance & Regulatory Journal twice yearly. The Journal was developed in response to research undertaken with compliance professionals in 2005 which established the need for a high quality publication that would provoke thought on current and emerging issues. We understand the importance of reaching your audience with a timely marketing message. To ensure your organisation is front and center, our digital advertisements reach decision-makers and can help your organisation build awareness of your services and products. Advertising with us also helps organisations promote conferences and events, webcasts, white papers and any other information you need to share with prospective or existing clients. Please view below for an example of the premium placement ad on the front page of the website. When you purchase a job ad on the GRC Institute you not only get a 2 month listing on our site, you also receive FREE promotions on our Social Media and Email Distribution Campaigns. Click here for more information. 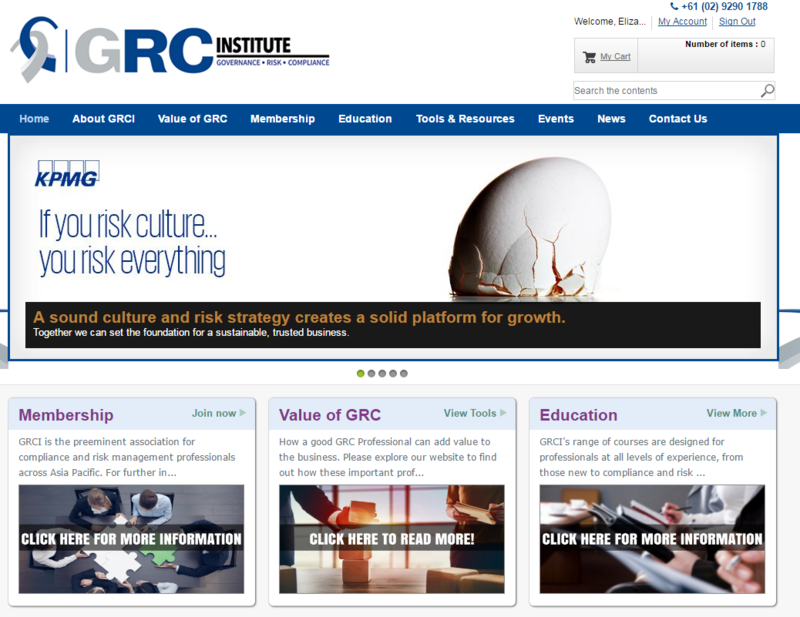 GRCI's email campaigns are an opportunity to reach more than 5,900 executive-level compliance and risk experts with information on your organisation, products or services. Distributed daily via email, our email campaigns combine the best content from the GRC Professional Magazine delivered to your desktop, laptop, tablet or mobile phone. We also hold regular networking events, seminars and workshops for members and non-members, an opportunity for your organisation to bring awareness of your products and services to a niche market.